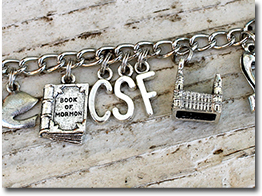 Want to add a personal touch to your bracelet? You can now add initials, extra dangles, and birthstones! 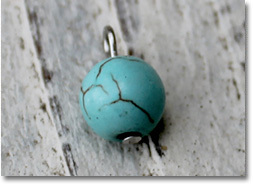 Below I have included the dangles that I offer along with a description of how they are placed on the charm bracelets depending on what you order. Adding the initials and birthstone dangle to the Holy Ghost Charm Bracelet. If you have something different you would like to do that is not listed, contact me at info@jonesing2create.com. Typically it costs $2 for each letter charm you add and $1.50 for each dangle. Once we decide on the design, I can send you a custom invoice with the final price. 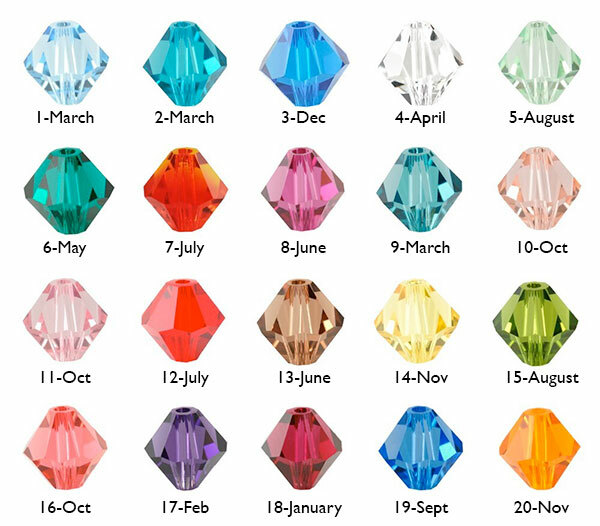 I offer Swarovski Crystal 6MM birthstone dangles in the following colors. I have noticed that sometimes the birthstones vary according to which chart you are looking at. So I have matched the months with a couple of different variations so that you can pick your favorite. Or forget the "birthstone rules" and just pick some colors that you like! When ordering, be sure to include the ID# listed below. 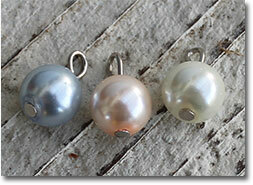 Note: The colors on these pearls is very subtle. It is especially hard to tell the difference between the white and the pink one unless they are right next to each other. If you would like your charms or dangles grouped any differently than outlined below, please specify in the comments when ordering your bracelet. 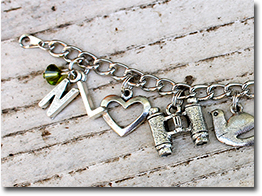 When adding 1 to 2 letter charms, I group them together and add them right after the last charm on the bracelet. If you order a dangle, I group it along with them. If you order 3 or more letter charms, I don't group them together on the same chain link because it gets too crowded. Instead I space them out in the middle of the bracelet. If you order a dangle, I add it to the middle letter. If you order just one dangle, I group it with the heart charm. For motherhood bracelets, how the dangles and letter charms are added will depend on how many are requested. If you have a specific way you would like it done, be sure to let me know when ordering.